Home / News / News / Which Outdoor Pizza Oven to Choose for Your Outdoor Area? Which Outdoor Pizza Oven to Choose for Your Outdoor Area? Wondering which of our awesome outdoor pizza ovens is going to be the best choice for your home? We’re here to help! While it’s always best to consult with our onsite, on hand experts, we know that coming into the store isn’t always possible. That’s why we’ve put together this little mini guide to our three great models available in store. So read on and check out which outdoor pizza oven to choose for your outdoor area. Our Alfresco Wood Fired Pizza Ovens are all built to commercial specifications, come with a stainless steel flue and accessories, and a dome top with ceramic insulation. You have the option to have us do the installation, so that the oven is fully assembled when you get it, or to do it yourself, if you’re feeling a little bit adventurous. In the DIY kits, you will have to pour the slab for the oven yourself. Our original model is our most popular selling outdoor pizza oven in our range. The oven itself measures at 1400mm wide, 1500mm deep, and 700mm high, with a flue of 1000mm. Perfect for yards and entertaining areas! Our Midi Model is simply a smaller version of our original model. This one is popular with people who have smaller spaces but would still like to have the addition of a pizza oven in their yard. As we said, the dimensions are smaller, so they come in at 1100mm wide by 1200mm deep by 620mm high, with a flue, again, of 1000mm high. The Courtyard Model is our smallest model designed specifically for courtyards or quite small spaces. Featuring the same design as both our Original and Midi Models, the Courtyard Model has measurements of just 950mm wide by 1050mm deep and 600mm high. The flue is again 1000mm tall. This model is ideal for people with a front or back courtyard who would like to get their hands on their very own outdoor pizza oven! 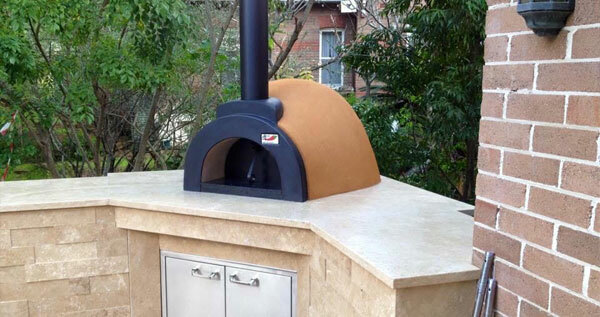 At Sydney Heaters & Pizza Ovens we take great delight in bringing you the best of the best in outdoor wood fired pizza ovens. We love receiving photos from our customers grinning and using their brand new pizza ovens for their first slices of delicious homemade pizza fresh out of the oven! While it takes time to get your recipes right, we’re sure that you’ll find your ideal pizza to make to impress your family and friends. Browse through our Original, Midi, and Courtyard ovens to find out which is the best model for your backyard or front yard areas, or call us to find out all the specs on each on 1300 938 346.